Home › Home and Kitchen › [20 Pack] 32 Oz. 2 Compartment Meal Prep Containers Durable Bpa Free Plastic ..
[20 Pack] 32 Oz. 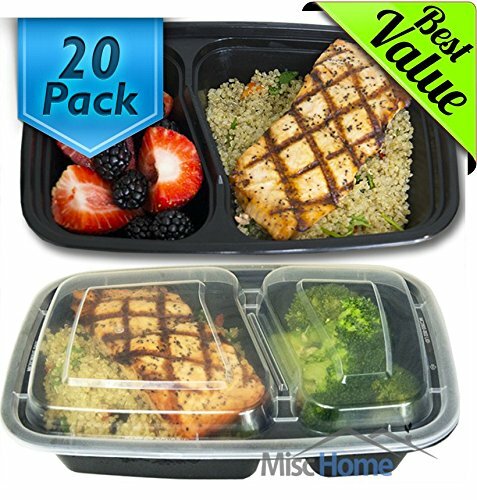 2 Compartment Meal Prep Containers Durable Bpa Free Plastic ..
BEST VALUE 20 COMPLETE CONTAINERS (20 Lids & 20 Bottoms) - These premium 2 Compartment BPA free (PP) food containers are microwave safe, allowing for convenient reheating of meals in seconds. Freezer safe and suitable for long term food storage. Dishwasher Safe. PORTABLE AND CONVENIENT - Replace your lunch bag with this fabulous portable 2 compartment food container storage and meal prep to go container; take it to work, school, or on outings and picnics; the bento box is a perfect healthy lunchbox. 2 Compartment for easy separate storage. MULTI-FUNCTIONAL - As well as being great for diet 21 Day Fix and portion control, these containers are great for storing food to keep fresh.They're also stackable, reusable and extremely durable too. all in all one of the best food containers on the market right now! TOP-RATE QUALITY & PRICE - PACKAGED In the USA for quality control, We Guarantee the quality of all of our products if anything is not satisfactory we promise your money back or replacement with no questions asked or charge. The Misc Home Meal Prep containers are the best way to prepare food ahead oftime and keep it fresh. Durable enough you can use many times, but affordableenough you can toss after a few uses. Perfect to lose weight, track your diet,control your portions and build muscle. Anyone on a diet plan that requiresmeal prep, and those of us with a busy schedule that wants to eat a healthyand balanced lifestyle. The bento boxes come with an airtight plastic lidwhich prevents food from leaking out of the container and staining your otherpossessions. Its slim design makes it effortless to carry in your bag toschool, work, or wherever. They are stackable so that u can easily store them.The lunch boxes are BPA free, dishwasher safe, freezer safe and microwavesafe. Perfect for: IIFYM Diet - If it fits your macros, 30 day meal challenge,Bulking & cutting for bodybuilding, Paleo dieters, Meal planning for diabetesor other health issues, Pregnancy meal preparation, Any diet plan - Zone diet,vegetarian diet, vegan diet, weight watchers diet, raw food diet,Mediterranean diet, DASH diet, Gluten-free diet, TLC diet, Mayo Clinic Diet,Flexitarian Diet, Volumetrics, Jenny Craig, Biggest Loser Diet and OrnishDiet. Enjoy!